Click on the image below to view the profile at 100%. Text from Erwin Hood's fantastic book "Heinkel He 100: Record Breaker". It seems likely that the October 1939 Japanese delegation had been visiting Marienehe in preparation for the purchase of which had begun 11 months earlier. Three He 100 A-0s, presumably built as Section II airframes, were delivered to Japan in the summer of 1940, but there is evidence to indicate that drawings of an earlier version had been handed over to the December 1938 delegation. The does seem to have been an intention to produce a licence-built version of the He 100 in Japan for the Imperial Japanese Navy. The aircraft was given the official IJN designation of AXHe1 (Carrier-based fighter, Experimental, Heinkel, Type 1). A subsidiary of the Hitachi petrochemical concern, known as Hitachi Kokuki K K, was established in May 1939 expressly to produce not only a version of the He 100 but possibly also a licence-built version of the He 100. A factory was built in Chiba on the eastern side of Tokyo Bay. At least one of the He 100s was sent to the Naval Air Technical Centre in Yokosuka where, between 15 August and 10 September 1942, it was subjected to propeller vibration tests. 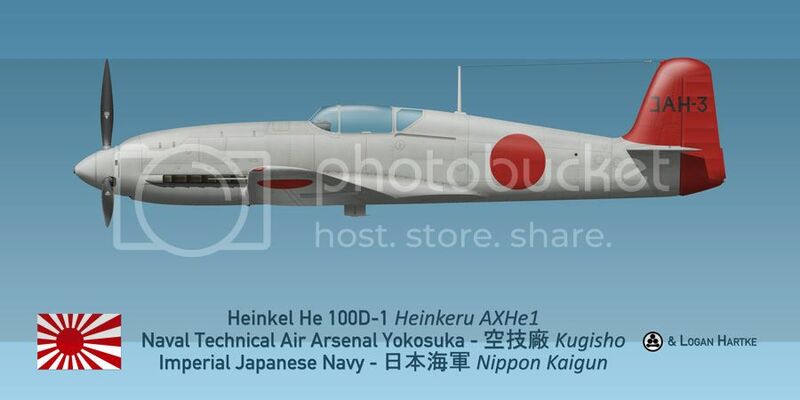 Also noteworthy is the fact that it is described as a Heinkeru 100 Model Fighter, not as an AXHe1. A note on the profile itself. This is a “what if” profile, but only in the sense that we don’t know what the He 100s delivered to Japan really looked like once they arrived in Japan. To my knowledge, there are no known photographs of the aircraft of descriptions of their markings. Judging from the He 100s sold to the Soviet Union, I find it likely that they would have been painted in overall gray by Heinkel before delivery. We do have at least one photo of an He 112 that was purchased by the IJN, and the scheme I’ve put the He 100 in is based on that. 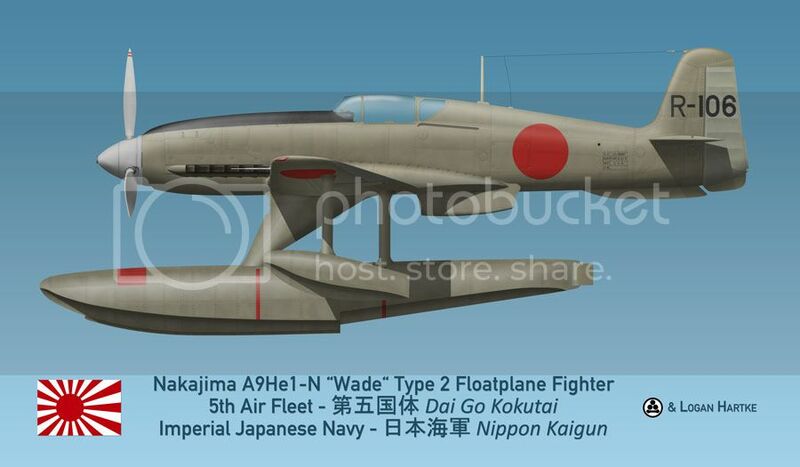 It actually looks very Japanese in that scheme. I had to make sure it wasn't a Ki-61 Tony. A Japanese He-100 like this could cause some confusion at a model show. Thanks very much, guys! I'd LOVE to see this one in plastic, too! 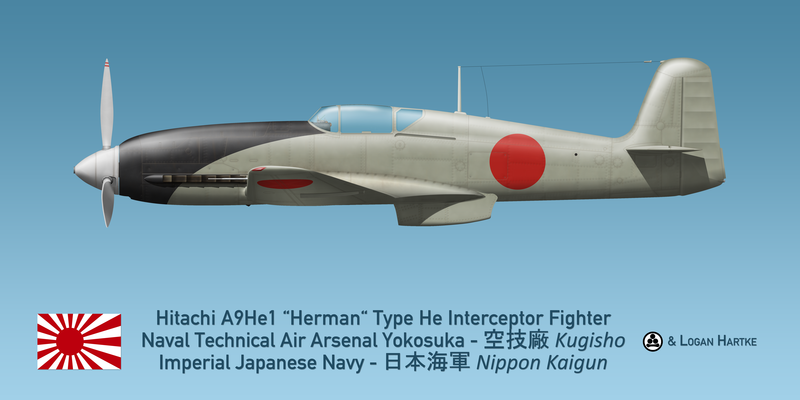 Re: Japanese Heinkel He 100s - The AXHe & Hitachi A9He "Herman"
In mid-1940, Imperial Japanese Navy testing of the Heinkel He 100 (designated AXHe1 by the IJN) proved very successful and Hitachi was contracted to begin license production of the aircraft as soon as possible. A subsidiary of the Hitachi petrochemical concern, known as Hitachi Kokuki K K, was established in May 1939 expressly to produce the fighter at a new factory constructed in Chiba on the eastern side of Tokyo Bay. Intended for the land-based interceptor role, the ‘A-’ designation was carried over from the AXHe experimental He 100 purchased from Heinkel. Following on the designations for the A7He (Heinkel He 112) and A8V (Seversky 2PA-B3), the license manufactured He 100s were designated A9He. 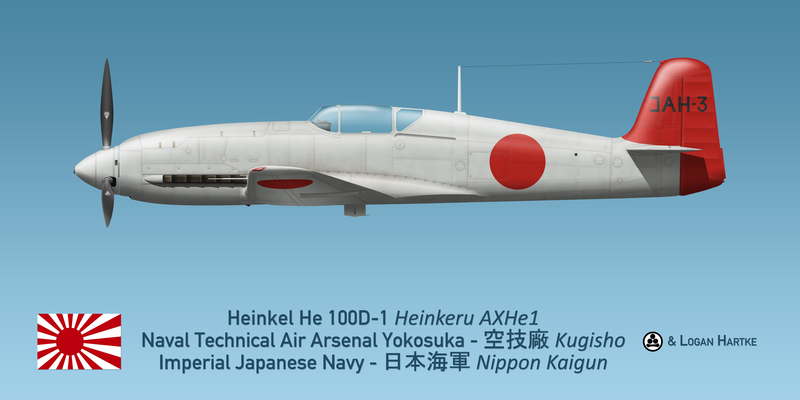 Unlike the US Navy, whose company designations reflected the manufacturer, in the Japanese Navy, the company designations reflected the designer, in this case Heinkel. To power the new aircraft, Aichi license built the DB 601 as the Atsuta for the Navy, while Kawasaki built DB 601s for the Army as the Ha-40. In an effort to get more of the aircraft produced even sooner and as insurance against possible delays from the relatively inexperienced Hitachi, Nakajima was also contracted to begin production of the He 100 in late 1940. This led to the somewhat amusing scenario of Aichi producing Atsuta engines and delivering them to Nakajima to power A9He interceptors, while Nakajima was producing Sakae radial engines and delivering them to Mitsubishi to power the famous A6M “Zero” fighter, while Mitsubishi was producing Kinsei engines and delivering them to Aichi to power their D3A dive bombers! The most major change to the He 100’s design was the replacement of the troublesome retractable radiator with a fixed radiator aft of the wing and cockpit. This led to a reduction in top speed, but improved cooling drastically, something that would prove essential for use in the Pacific theater. In anticipation of the aircraft's service with the IJNAF, the Allies assigned the He 100 the nickname "Herman", reflecting its German heritage. The profile above depicts the prototype A9He1 produced by Hitachi. As the Aichi Atsuta engines were not yet ready, it was powered by a DB 601. I will be using this as inspiration on one of my He 100's if that's ok with you Logan ? Absolutely, NARSES! I can't wait to see it! The radiator comes directly from a Ki-61. Thanks for the kind words, everyone! As always, click on the image below to see the picture at 100% or view it at my DeviantArt page. I've also submitted this to the All Things Floaty GB over at the Beyond the Sprues Forums. Realizing an immediate need for a fighter plane that could operate in remote areas of the Pacific where the construction of airfields was impractical, in late 1940, pending production of the fighter floatplane N1K1 Kyofu (code named “Rex”), the Navy issued 15-Shi specifications to Nakajima Kikoki K. K. to develop a floatplane fighter version of the A9He1. Work began on the project, which was known as the AS-1, in February of the following year. Eliminating the undercarriage and retraction mechanism, which was faired over, a unique triangular main strut and two secondary struts were used to mount the single main float; the outrigger floats were mounted on single slender struts. This float system ensured the least amount of drag, yet was sturdy enough for practical seaplane use. The tail wheel was removed and faired over, and to increase lateral stability, a long narrow fin was added to the bottom of the fuselage below the tail assembly and the rudder was extended downward. The 15-Shi floatplane flew for the first time on 8 December 1941, the same day Operation Hawaii (the attack on Pearl Harbor) was carried out. Production began in April 1942, and under the designation A9He1-N Type 2 Floatplane Fighter, the Navy accepted the new float fighter in July 1942. The type was first encountered at Guadalcanal, later being assigned to the Fifth Air Fleet during the Aleutians campaign, being based on Kiska and Attu, serving as a defensive fighter and reconnaissance fighter. On the 5th of August 1942 the Dai 5 Kaigun Kokutai (Fifth Air Fleet) was formed with fighter and reconnaissance seaplanes originating from the Tokoh Kaigun Kokutai. Of the twelve fighter seaplanes with which the Kokutai was to be equipped, only six were in working order, those were coming from the Tokoh Kaigun Kokutai. On the 8th of August, during an attack carried out by United States destroyers and cruisers on the seaplane base of Kiska, the fighter seaplane forces were reduced to eight, following the destruction of four of those that were anchored at the aforementioned precarious naval base. The US Navy seaplanes that had been catapulted from the US cruisers also participated in this attack. Ship’s Lieutenant Yamada and the 3rd class naval pilot claimed the destruction of one of these. At this time, the Allies had in the zone a squadron of heavy bombers, two squadrons of medium bombers, four squadrons of fighters, including a Curtiss Kittyhawk squadron belonging to the RCAF (all under USAAF command), a squadron of Grumman F4Fs and another of flying boats, both belonging to the US Navy. During the rest of the month of August, Dai 5 Kaigun Kokutai was involved in the interception of bombers and the US seaplanes, which attacked the Japanese military establishments at Attu and Kiska, failing to obtain any positive results. On the 7th of September, however, the Japanese pilots claimed to have inflicted damage on an enemy seaplane and three bombers. According to the United States’ sources, one seaplane was lost during these actions. Nakajima’s Koizuma plant built total of 327 A9He1-Ns were produced through September of 1943 when production was terminated. The Allied code name for the A9He1-N was “Wade”. Despite the weight and drag of the floats, these fighters were fast and powerful. They served their mission very well initially, but in a short time they were unable to effectively counter Allied land-based fighters. This was one of those profiles that just made sense, as far-fetched as it may seem on the surface. When you think “Japanese license-produced He 100 floatplane variant”, it seems like a bit of a logical pretzel to get there, but it was a very natural progression. The IJN wanted to license-produce the He 100 and initially assigned it to Hitachi. Nakajima was eventually contracted to license-build the A6M Zero because they needed enough to equip the land-based squadrons as well as the carrier squadrons. I figure that the IJN would really get excited about the He 100 once they got a good chance to evaluate it and got the production jigs from Heinkel, and would decide to have Nakajima license produce it instead of the A6M since Hitachi was new to the game. So, why would the He 100 become the floatplane fighter instead of the Zero? Because that’s what Nakajima would have been producing at the time, the main reason it was the Zero in the first place. Sorry it took so long to get this all together. I hope you all like it! And, as usual, good reasoning behind it.